Whether this music is “gothic,” “ethereal,” or “ambient” is in the eyes of the beholder. The truth is that BlackTape creates incredibly passionate music incorporating all these genres, yet transcending them with striking musical poignancy and lyrical insight. For this album, Lucian Casselman is out and A Chaos of Desire-era vocalist Juliana Towns is back. While the lineup returns to the more collective sense of performances from past albums, core performers Sam Rosenthal and Oscar Herrera, along with flautist Lisa Feuer (who adds a fine new dimension to the general instrumental approach), still have Vicki Richards on violin on various tracks, but Mera Roberts only plays on one song while other guests perform oboe, harpsichord and other instruments. After the marvelous Remnants of a Deeper Purity, As One Aflame Laid Bare by Desire lacks a little something in comparison. The trademark lushness of performance and instrumentation remains, and both Herrera and Towns, as well as Rosenthal, discharge their vocal duties as well as always (aside from the opening title track, which Rosenthal sings somewhat awkwardly). Still, too many pieces veer toward the tastefully anonymous at points, while the lyrical focus on Marcel Duchamp’s work “The Bride Stripped Bare,” though intriguing, almost turns the album into a running essay rather than a series of songs. This said, there is still a number of strong, focused pieces, including the Apollo-era Eno evocative “The Apotheosis” and “Russia” (which quotes the same Prokofiev line as Sting’s “Russians,” but much less obnoxiously). “The Green Box,” meanwhile, contains the classic sense of brooding electronic menace and beauty, heightened by Richards’ violin, which has so often defined Black Tape’s most successful work. 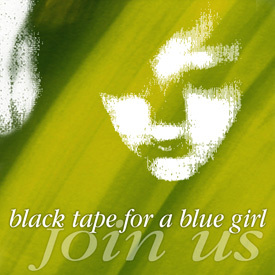 Fall 1999 If change means growth, then no band has grown more in terms of their sound than Black tape for a blue girl. Sam Rosenthal, the band’s founder and primary songwriter, has always surrounded himself with more than just competent musicians. He surrounds himself with people who have a true feeling for his music — people who bring out the living energy and soul of what he has written on paper. This is true of the upcoming Black tape release, As one aflame laid bare by desire. Only this time, the music is often supported by wind instruments. This truly unique feature of Black tape’s music gives the band an almost archaic sound. (Bravo!) It stands out above the rest in this day of over-processed, over-produced ensembles. The music is thus intelligent and contemplative. It is different from previous Black tape releases in that it is more melodic, less ambient. Sam says this is because of the use of instruments like the flute, played very nicely (I might add) by Lisa Feuer. As far as the lyrical content of Sam’s music goes, he continues to draw upon a deep well of emotional fodder. Very often he uses his own personal journals for inspiration — loves found, loves lost, places traveled, people encountered, etc. On the new album, he adds a very interesting source to nourish his already fertile mind — the work of French artist, Marcel Duchamp. Even the title of this new CD, As one aflame laid bare by desire, has significance in the Black tape scheme of things. “The idea for the title was given birth to by a Duchamp piece,” reveals Sam — whose esoteric inspirations have made him the darling among goth’s art elite. “It’s about desire as a mechanism to reveal things . . . both in the mental sense and a physical one. The title song itself deals with different aspects of what is uncovered when one is in a state of desire or enhanced senses.” Your only desire right now should be to pick up this amazing CD. Rosenthal’s black tape for a blue girl embraces Brian Eno’s ambient ideas along with sensual and enchanting vocals. Surely their best album as far as I know since A Chaos of Desire to my taste.The ethereal & melancholic sound of this album makes you completly dreamer & romantic. All over the 70 minutes of this beauty resounds the wonderful voices of Julianna Towns & Oscar surrounding and adorning by the Sam Rosenthal’s keyboards. Surely the greatest mariage of the ambiant neo-classical scene. In the image of Dead Cand Dance, Black Tape for a Blue Girl is again gone far away from the limits. Lisa Feuer’s flutes are almost the main character of the album, by adding this such special atmosphere to the dark melancholia of As One Aflame… We can noticed the motif of Prokofiev’s Lieutnant Kije Suite, wonderfully played by Vicki on violin. With a such luxurious beauty, this album is an unique & unbelievable collection of unholy pleasures. Instead of adding dark & obscure elements, Black Tape for a Blue Girl simply play by themselves, by using some chords & emotional poetry to make the result far away for any kind of music. And this last album shows the potential of a such creative imagination, of this fantastic natural darkness which surrounds the band since more of 10 years. By listenning to a such album by night raining, a strange & curious sensation enters your head… This feeling to be illuminated by a non-human inspiration, to be transcended by an enigmatic soul… Nothing can be compared to a such feeling. And this one only comes by listening to a pure hypnotic “music” like Black Tape for a Blue Girl. How to put eternally the obscureness on a music… Right here is carved the answer. 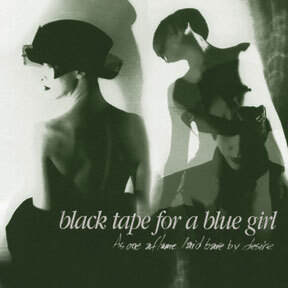 black tape for a blue girl returns — refined, elegant, gracefully exquisite. Lyricist/songwriter Sam Rosenthal creates an aural play in which voices and instruments are cast to portray his artistic vision. A lot of As one aflame is damn near brilliant in its artistic reach and dramatic scope. With otherworldly electronics, lone violin and weeping flute all draped around the solemn whispers of Rosenthal (and the evocative voices of Julianna Towns and Oscar Herrera), black tape provides a most ghostly encounter. At times, black tape echoes the romantic indulgence of This Mortal Coil, with haunting female vocals and ornate neoclassicism juxtaposed against an ominous, frozen landscape of strings and keyboards; Rosenthal’s art achieves both an eerie sonic calm and an intense degree of emotional extravagance. As one aflame can’t be dismissed as a misguided attempt to invigorate the well-preserved corpse of the darkwave. This stuff is quite guided and very much alive. Clearly, labels like ‘gothic,’ ‘death rock’ and ‘gloom’ are more about the mood, the fashions and the feelings the music provides. Stretching the goth genre even further, black tape for a blue girl incorporate orchestral elegance with a New Age-ish spirituality and literary introspection. Their latest As one aflame laid bare by desire is a symphonic mix of poetic vocals and ethereal atmosphere. Yes, it’s dark, but instead of wallowing spooky pretense, the band — which features a flutist, violinist, acoustic guitar and keyboards — focuses on instrumentation and conceptual themes. Far from depressing, they bring beauty and depth to a genre known more for sorrow and menace.